Join us for the next 11 Day Anusthan celebrating the beauty, strength, protection, delight and all-accomplishing divine power of Ma Durga! The mantra Durga comes from the roots, “dur” (meaning invincible or impossible) and, “gam” (to pass through). Her name Durga means impossible to go through or overcome. Many times Her name is spoken of as meaning “fortress” that protects Her devotees. Thus, She is the one who takes care of all problems or difficulties, no matter how surmounting they seem to be. As the story of Durga goes, a demon named Mahishasura, did great tapasya and was granted a boon where he could never be killed by any man, animal, or god. As time passed on the demon overthrew the lands and heavens and no one existed that was strong and skilled enough to overcome him. The Gods weren’t powerful enough, the animals lacked aim, and the men were overthrown. Due to this the Goddesses Parvati, Lakshmi, and Saraswati combined all their Shakti together and all of the God’s offered their weapons (skillsets, wisdom, and power) to create a new breed of super-goddess known as, “Ma Durga.” Being a manifestation of the Feminine, She was of the right type of being needed to destroy Mahishasura. And, being of the Divine, She was skilled and powerful enough to overcome his evil powers. During Navratri (or Navaratri) 9 nights are celebrated depicting the 9 nights of battle between Durga and the great demon Mahishasura. On the 10th day, also known as Dussehra, Durga destroys Mahishasura and all balance was restored to the realm. In northern India the 10th day is also celebrated as Ram overcoming all of the evil of Ravana, in which case a Ravana statue is often built and then burned symbolizing freedom from negativity. These two celebrations overlap and often confuse the non-Hindu. Please join us in reaffirming our commitment to living a life of positivity, love, service, attunement to and protection of the Dharma! It is said that when the Dharma gets forgotten the Devi will manifest to remind us. Now is that time! As we attune to Durga during this Anusthan our goal will be to become consumed by Her Presence, allowing Her to do Her Work in us. This can manifest as an endless array of Blessings, but mostly She gets portrayed as being a "warrior goddess" that will fight away your problems, however, interestingly enough, She is the Embodiment of Pure Love and Light in whose Divine Presence nothing maligned or dark can exist. When you are in Her Presence, within Her Fortress, you are protected by Her Light and Love so that you can focus on your Dharma. Being a "demon destroyer," she clearly supports the Dharma, which is why we would like to focus on that, for obvious reasons. During this Anusthan, we will also do a special puja, similar to the "Black Hat" ceremony of Tibetan Buddhism, where we will connect to a murti and it will cleanse us from an uncountable number of eons or lifetimes of past karmas. And, with Her Grace, it will help us take a step in the right direction. 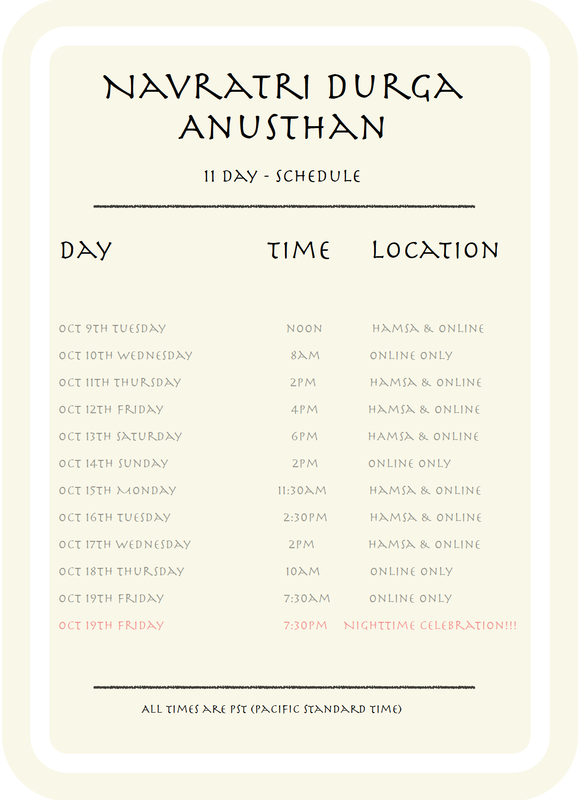 attend the streaming from the link posted on the Anusthan page. The Zoom link will take you directly to the streaming/event room. Please make sure your audio and webcam are turned off.